The London Eye Leading visitor experiences company Merlin Entertainments is making extensive use of Audinate’s Dante audio networking technology at a variety of its London attractions. These include a number of popular sites on the city’s South Bank, including the Coca-Cola London Eye, SEA LIFE London Aquarium, and Shrek’s Adventure! London. The installation at Shrek’s Adventure! 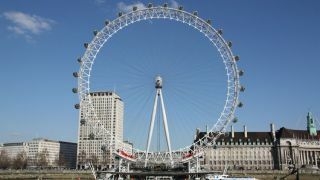 London—which opened in July 2015—is particularly notable given that it is “one of the ‘heaviest’ attractions that Merlin has created in terms of AV,” according to Simon Casey, senior show services manager at the Coca-Cola London Eye and has also been involved in many other Merlin AV system projects. For Shrek’s Adventure! London, Dante facilitates audio processing and playout as part of a setup that also features Medialon show controllers, 7thSense media servers, BSS DSP, Crown amplifiers, and VUE Audiotechnik loudspeaker systems. In the case of Shrek’s Adventure! London, this need for simplicity was even more acute given the complexity of an installation requiring intensive interaction between performers and projections, as well as close synchronization of audio and video. “So with Dante what we needed was rock-solid reliability—and that’s what we got,” Casey said.